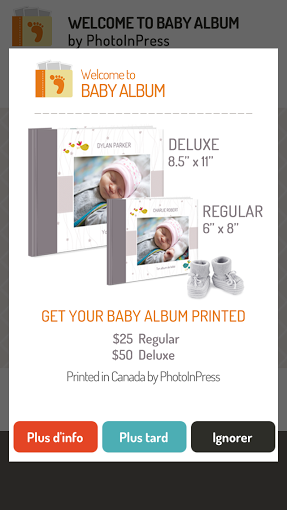 PhotoInPress, a photo book company based in Montreal has launched new features to their Baby Album app. 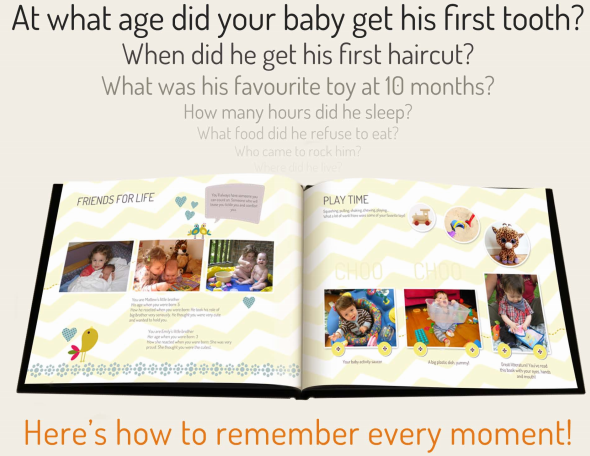 The app takes the best of photo books and adds all the content we need to create a baby first year album in no time. We can complete making the book on a mobile device. The best thing is we do not need to be complete designing the book right away, as we can add our content wherever and whenever we have time. I really like that this app allows us to easily focus on remembering the memories. The app simplifies the process with its eight different sections we can choose from, if we do not want a section we can easily delete it. If we choose all the sections or chapter then the book will fill 74 pages of content. Adding the content has also been made easy for us, since all we have to do is answer the questions specific to our child in each section. The photo book allows over 200 photos to be placed to preserve every moment. Since the app allows direct access to our digital pictures we do not have to transfer them to access it. The images and text adjust to the design so we do not need to position it to the layout. When the book is complete we can order a print version starting at $25.99 and get our high-quality baby album within 2 to 3 days. I am glad these books have a custom hard cover, and uses acid free archival paper for the colour to remain vibrant for years to come. This app can be used to remember any memory you have from pregnancy, birth to first, and more. These albums are always fun for children, parents and family to look through and remember all the memorable moments. The PhotoInPress has the possibility for us to order more than one copy, which would make wonderful gifts. If you are in Canada and would like to make your own book then please enter the giveaway through the rafflecopter below and win a $40 value code. Please leave comments and follow my social media networks to be eligible to win. I live in Ontario and I really enjoy making photo books. I always make a book after each vacation since it is a fabulous way to capture and remember wonderful memories and experiences. Thanks for the chance! I live in Nova Scotia. Yes I have made them before. I enjoy making them because it is a great way to display your photos. I'm in BC. I have made several photo books with different companies and (normally) I love how easy it is and how quick compared to regular scrapbooking. The last 2 photo books I've tried haven't gone so smoothly so I'm looking for a new site to go through. I love making photo books for my husband as gifts. He looks forward to them every year. I gather photo's from the year and it's our basically our year in review. Love them. I'm not sure if my comment published, but I'm in New Brunswick. I've made "baby" photo books for each of my kids. I prefer that to individual pictures. I live in Nova Scotia, and yes I have made a photobook before. I live in Ontario. Yes, I've made a photobook before, with a different company, for my hubby. He absolutely loved it!! So did I.
I live in BC. I have never made a photo book before but have always wanted to! I live in BC. I love making photo books. I find that they make such awesome gifts for family! I'm in ON, and I haven't made a photobook before. I live in alberta and love to make photo books for my family! I am in Ontario and have not made photobooks before.. It is a good idea for sure. I live in Ontario and I have made photo albums before because I love my family. We have a brand new grandson born in August 2014 and I would love to make one for him.Thanks for the opportunity. Live in Ontario and have done a few photo books. Love them cause they can tell a story and hold a lot of pictures at the same time. I live in Ontario. Photo books make great gifts. I live in toronto. I have never made photobook before.Nov 7 is my daughter's 2nd birthday. I would love to make an photobook from her first month to 2nd year.